Marty Rowley speaks with AC Teach Club members. Texas has boosted high school graduation rates and narrowed achievement gaps among its 5.3 million public school students during the past decade. 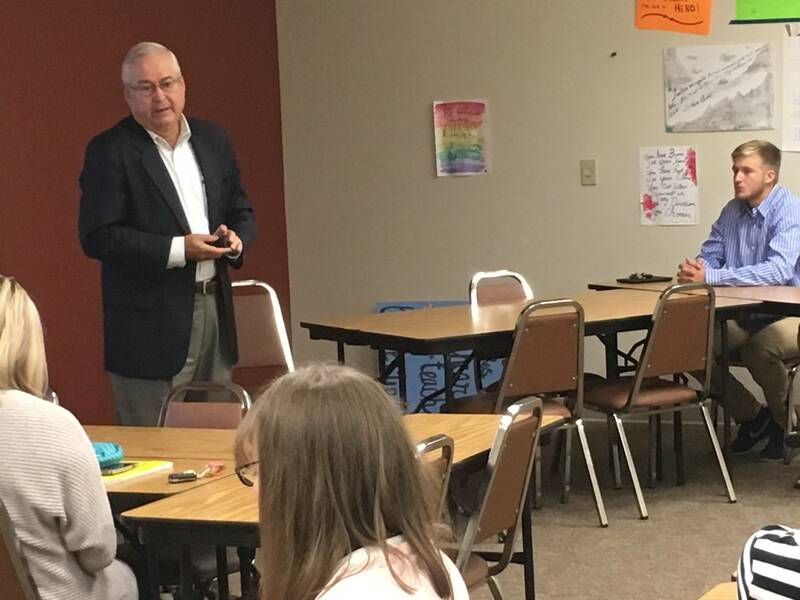 But as student population is projected to almost double by mid-century, large numbers of disadvantaged kids and finding enough qualified teachers are among the primary challenges, Texas State Board of Education District 15 representative Marty Rowley told a group of future teachers Thursday at Amarillo College. Texas finished this past school year with one of the highest graduation rates in the country – 88 percent. Graduation rates for black and Latino students ranked second in the country, which shows progress in closing achievement gaps, Rowley said. "We're doing a pretty good job of keeping kids in school," Rowley said, adding that passing rates for the state's five-subject end-of-course exams also show improvement. However, the challenge for new teachers is twofold, Rowley said. Of the state's 5.3 million students, 60 percent qualifiy for free or reduced lunch programs. Rowley said the number of kids who fall in that category is a sign of economic disadvantage, and pointed to studies that show that children from lower-income homes tend to begin school more than a year behind their counterparts in reading and language. Teachers must master the balance between making sure those children can catch up while teaching kids who begin school at level. Attracting and keeping teachers also is a problem as the state rapidly leaches good teachers to retirement and other professions. In general, some studies show a range from 17 percent to almost half of new teachers leave the profession within the first five years. Rowley said higher teacher pay and mentorship of new educators are ways to combat the teacher shortage.